Are divided into those with short antennae ('short-horned grasshoppers') and those with very long antennae ('long-horned grasshoppers'). 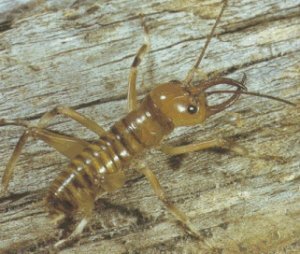 There are two distinct families of weta: Stenopelmatidae (which includes the tree weta, tusked weta, ground weta, and giant weta); and Rhapidophoridae (which includes cave or jumping weta). Giant weta or Deinacrida ('Demon Grasshopper') are very large, rather docile creatures, which like all weta are nocturnal. They are best found camping under bark or under stones during the day. There are eleven recognised species. These are the heavy weights, with weights up to 70 grams and lengths of up to 90mm. Diet is largely herbivorous. Tree weta or Hemideina can grow nearly as large as the giant weta. The main distinguishing feature is that they inhabit tree holes. The tree weta is often found during the day, inside these holes with its back legs protruding from the entrance. The tree weta uses sharp spikes on its rear hind legs to discourage would be predators. The six known species have an omnivorous diet. 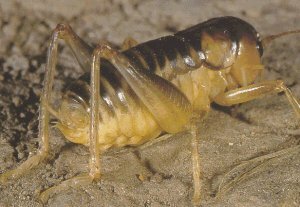 Ground weta or Hemiandrus as its names states, is a ground dwelling weta that prefers to live in tunnels excavated in the soil. 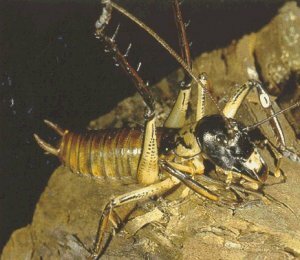 Unlike the tree weta the ground weta enters its tunnel tail first and uses its raised front legs and opening of its jaws to deter predators. The hind legs do not have fearsome spikes, instead there are only delicate spines, with an array of longer spines around the ankle. There are some 36 species of ground weta, which have mainly a carnivorous diet. 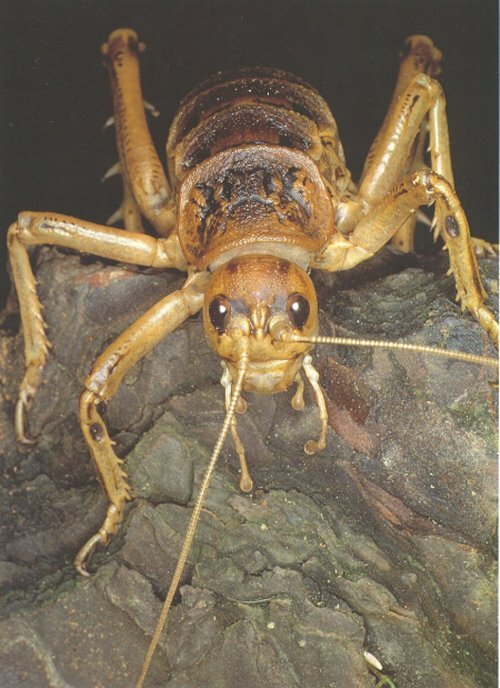 Tusked weta, of which there are three known species: Hemiandrus monstrosus, the recently named Motuweta isolata or "Mercury Island" tusked weta and the newly discovered “Ruakumara” tusked weta.. There is currently some debate as to whether Hemiandrus monstrosus should be in the genus Hemiandrus. The most distinguishing feature of the tusked weta is the presence of long, curved tusks projecting forward from the jaws in the male. Females look like ground weta. Both sexes can produce sounds like the ground weta, and possesses ears. Not much is known about their biology, other than the fact that the small North Island tusked weta lives in tree holes very much like tree weta, and possibly has similar social behaviour, while the large Mercury Island tusked weta is a ground dweller in shallow retreats scooped out of the soil and covered over with leaves. Cave Weta are a large group of about 60 species of the Rhaphidophoridae family. 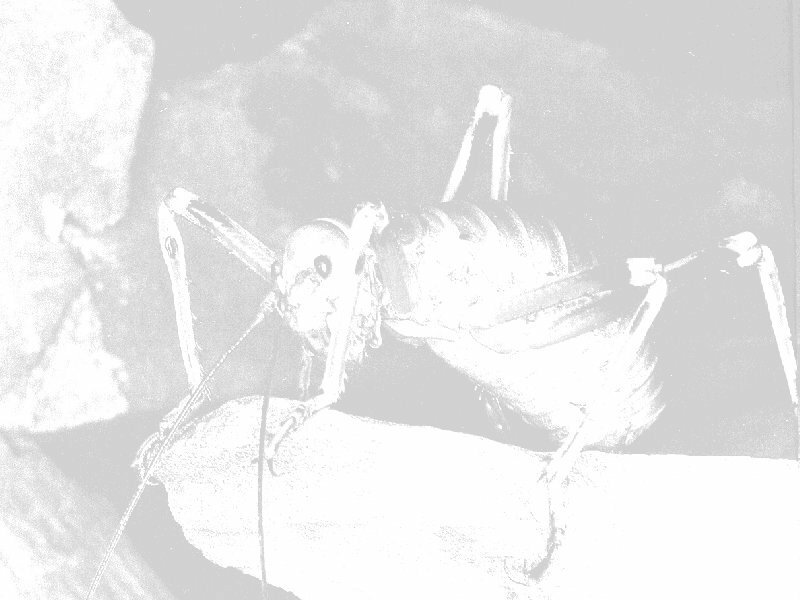 They are a distinctive weta with extremely long legs and antennae but comparatively small bodies. They are non-aggressive with amazing jumping capabilities. Their legs are thin and spindly and lack the presence of ears. They also lack a sound production method and adhesive pads on their feet. They feed as scavengers, devouring lichens and other organic matter from their environment. 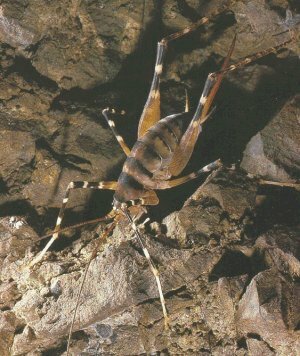 As the name suggests, most cave weta are cave dwelling, while others live in damp bush or high in the alpine zone under stones (Gibbs, 1994).